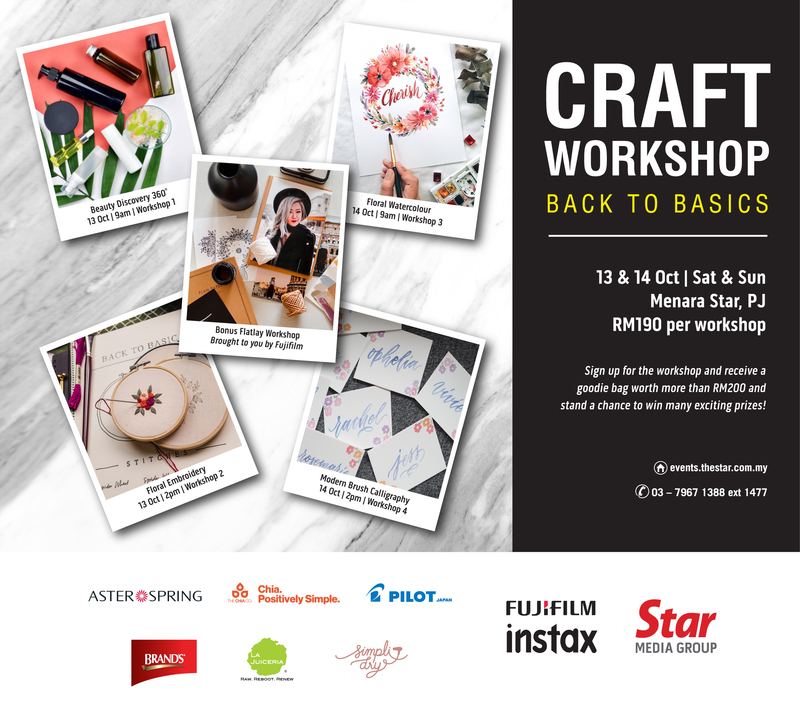 Go back to basics in our specially curated workshops- everything from calligraphy, embroidery, painting, photography and beauty routine. Unleash your creativity and master your basics with us! Sign up for the workshop and receive a goodie bag worth over RM250! Stand a chance to win many exciting prizes! To Register – Sign Up Here! All materials are provided & includes refreshments. Bring along your smartphone for the Bonus Flatlay Workshop Session. What are the myths versus truth on skin routine? Learn about what is your skin BFF and how to master the tips to perfect skin health during this skincare workshop. This workshop is conducted by Anni Tai | @annitaistudio , a fun and free loving artist. The workshop is for individuals who would love to explore their creativity at heart and is interested to pick up embroidery stitching techniques. It welcomes all and no prior sewing background is required. Atie Jaafar | @wkndiminlove, a watercolour artist whom founded Weekendiminlove, believes that art not only brings aesthetic value but it also brings therapeutic value in life. Atie will be sharing a basic introduction to watercolor whereby participants will learn basic techniques of watercolour and how to paint loose florals during the workshop. Inez Tan | @inezcalligraphy, co-founder of KLigraphy aims to help both children and adults alike get in touch with their creative pursuits through the art of beautiful writing. During this workshop, participants will learn how to control brushes to achieve nice thin strokes and beautiful swells as well as learn how to do basic letterforms with Pilot brush pen. All workshop includes a bonus Flatlay Photo Styling Tutorial (1 hour) brought to you by Fujifilm. Learn how to style and capture perfect flatlays which are Instagram-worthy. Bring home pocket-sized instant print photos and if you are lucky, you may even walk away with a Fujifilm Instax and other exciting prizes! You are entitled to register for the workshop subject to the terms and conditions herein. If you wish to register for the workshop to be held in Menara Star, Petaling Jaya on 13 or 14 October 2018, you must secure your space by making the payment via online bank-in and email us a copy of the bank-in slip for verification. Due to limited seats, you are advised to register early to avoid disappointment. One person may only register for one workshop. Following completion and return of the online registration form to the Organizer, a confirmation email will be issued via email upon successful registration. If you do not receive the email within three (3) working days from the date of registration, please contact our customer support team at +603-7967 1388 ext 1477. No cancellation will be accepted once payment is made. You may appoint your replacement for the workshop by serving a written notification to the Organizer at least five (5) working days prior to the said workshop date. The conference fee paid will not be refunded if the participant or his/her replacement (as the case may be) does not appear on the event date.